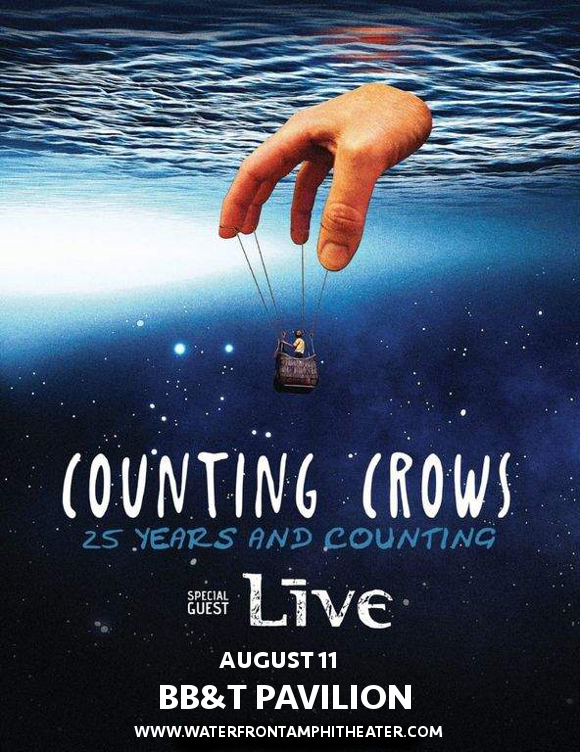 Counting Crows fans get ready for some big news!! It’s the band’s 25th anniversary, and they’re celebrating with a HUGE 40-date tour with Live, coming to perform at the BB&T Pavilion on Saturday 11th August 2018. It’s going to be one awesome concert – don’t miss out!! Grab your tickets NOW while they last! With sales of over 20 million albums across the world and an Academy Award nomination for their song "Accidentally in Love," Counting Crows have a long and successful legacy to celebrate! Kicking off in Boise’s Taco Bell Arena, the trek, entitled the 25 Years And Counting Tour, will take them across all major cities in the United states before going out with a bang at the Pilgrimage Festival in Nashville!! They’ll be supported on the road by Live, who recently re-formed with their original vocalist. We can hardly wait to hear it all live – can you?? Then what are you waiting for?? Grab tickets NOW while you still have the chance! !